Edition 5 of our best selling book for Lean and Six Sigma professionals is now available for pre-order, with first shipments on the 1st October 2017! 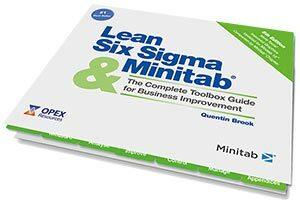 Lean Six Sigma and Minitab has sold over 150,000 copies worldwide since it was first published in 2004 and has become the book for all business improvement professionals. Edition 5 now has over 140 key tools and techniques covering Lean, Six Sigma, soft skills and Minitab software, and includes a completely revised chapter on Companion by Minitab software. What’s new in Edition 5? The book is published by OPEX Resources and is supported by an extensive range of complimentary support resources including a free Tool Finder app, data files templates, training slides, Minitab menus, articles, industry news and access to a readers LinkedIn Group.